One of the unknown environmental activists of out time is Bruce Sterling. It frustrates me that he, and other people with a 21st Century perspective, is not given more room in the discussion about sustainability and climate change. He started the Viridian Design Movement in 1999 and closed it in 2008 http://www.viridiandesign.org/. I think there are good reasons to believe that people will look back 20 years from now and point at this, and other similar initiatives, as the start of the new generation of sustainability work. Shaping tings is a fun book that is well worth reading. It has the feeling of a teenager that look at the world with fresh eyes and was allowed the time to get the thoughts down on paper. The structure that is presented is interesting even if the different phases of humanities relation to things has been discussed in countless books. The design and connected economy present a new filter for the history, but any reader should be aware that the book is also shallow in a way that makes it more of a source for general inspiration and less helpful for those looking for concrete guidance. Still the book is written in a way that could/should inspire a new generation of activists. This time not biologists and bird watchers that saw that the consequences of industrialization and gave us books such as silent spring 30-40 years ago. That was the first generation of “environmentalists”. It also moves beyond the current generation, that is dominating the discussion today, who uses the language of the economists and lawyers (often without deeper knowledge of the disciplines) and focus how the current system can be tweaked. These people spend the time trying to put a price on nature (eco system services, etc) or argue that it is illegal/expensive to destroy nature from an anthropocentric perspective that use today’s economy as the reference. They give us CCS, a shift in current car fleets to biofuel and other dead-end solutions. If the first generation wanted to “get back to nature” the second generation wants to see incremental solutions, such as CCS and biofuel for cars. Sterling is part of what I would like to call the third wave of environmentalists that take for granted the fact that our planet has limits and that changes are needed. This generation approach the challenge through the lens of 21st century technology and values. The focus is on how things can be changed, not on the surface, but fundamentally as we move into a society of transformative transparency (I like to call it that, others prefer radical or ultimate transparency. Sterling talks about transparent production. It does not really matter as the focus is the same, a world where distance and time does not equal less information/understanding). 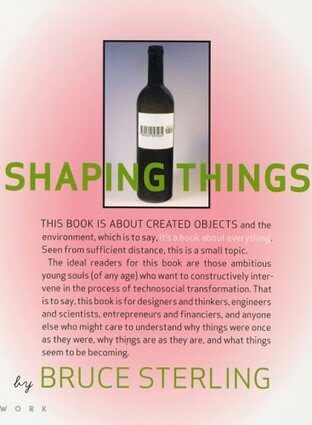 Sterling use the more academic/older term: “ubiquitous computing” and describes the book as ” a speculation about “ubiquitous computing in the service of sustainability”. It is “designers” that Sterling writes about, designers that make things “talk” and that allow for a new transparency. The fact that we are destroying the planet and treating people really bad should not result in an urge back to a simple society, but provide energy to create a society that can give everything value (not prize). I was surprised to see that the book is from 2005. When reading it I got the feeling that was written mid 90:s, or earlier, but we live in a time of accelerated change and if Sterling would write the book today I think it would look quite different. In parts it is the technology version of Bret Easton Ellis. It is fast, fun and without any clear ethical compass. It is homo ludens surrounded by high-tech, but with an understanding that how we treat the planet and each other are fundamentally wrong. Not just from a “biological” perspective, but from an esthetic. Our society are designing ugly things in the sense that we destroy beautiful things and creating irreversible damage. When Sterling presents his response to an unsustainable society it is in the shape of the “SPIME” that “have the capacity to change the human relationship to time and material processes”. This is when the books becomes really interesting. Much of the later part is spent to discuss the outline of a world with SPIME’s. It is nothing very concrete but a lot of inspirational snippets. I like these rough outlines as they are like a good abstract painting where your brain is starting to see patterns and thing about different applications without being “forced” in a specific direction by the writer. Maybe the one major thing missing in this book is a discussion about ethics, what are the underlying values that will dominate the connected economy and what are the sub-groups that will influence the development of the underlying infrastructure and direction of the connected society.